A few months ago I was watching the Tonys on the TV and there was this play I had never heard of winning everything in sight. When Mike told me that it was coming to Center Rep I was all atwitter looking forward to it. That’ how we got to see Vanya and Sonya and Masha and Spike Saturday afternoon. I think the production in New York had a different cast. Or director. Or script. Something didn’t make the trip from Broadway to Locust Street. Playwright Christopher Durang wondered what if his life was more like a Chekov play, and wrote this to find out. The characters all bear the names of Chekov characters, the plot is cribbed from Chekov, there is even a cherry orchard. it’s all very interesting if you have an MA in lit crit, but self conscious and pretentious if you don’t. I don’t. One of the things I wonder about in life is how to tell if I’m seeing a poor actor or the results of poor direction. One of the characters in this play is Cassandra, the housekeeper. All four of us thought she was chewing the scenery, overacting with every line. The fault of the actress or the director? Beats me, but it was a major weak spot in the show. The plot is simple–Vanya and Sonya live in their parents house, which is now owned by their sister Masha, a self-centered actress who is rarely present but pays all the bill and supports them. Masha shows up with her boy-toy, bosses everyone around, threatens to sell the house and put her siblings out on the street. Some stuff happens, everybody lives happily ever after. 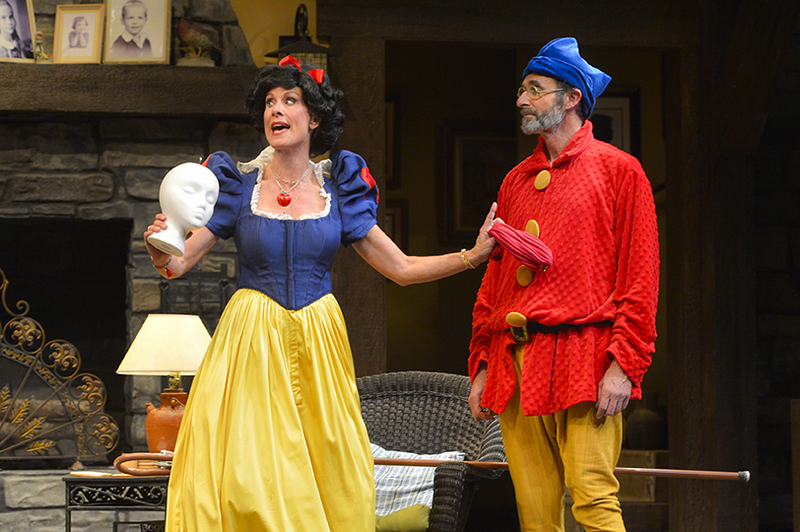 The strongest part of the play is in the second act when Vanya (Jackson Davis) has a long monologue railing against modernity and longing for the old days when you dialed the phone and watched Ozzie and Harriet. I don’t know that the sentiments expressed are all that original or important, but the speech is well delivered and decidedly electrifies the house. Vanya and Sonya and Masha and Spike wasn’t a bad play, it just wasn’t very good. After the awards it won in New York I was expecting something wonderful, and it just doesn’t deliver on that promise at all. Drat.